I love pineapples and I love paneer. I grow my own fresh basil so this is the most natural salad for me all the time. Yes this is a very frequently repeated salad at my place but when I forget about it I really do. And then I start missing it. And then I make it for a week every single day. 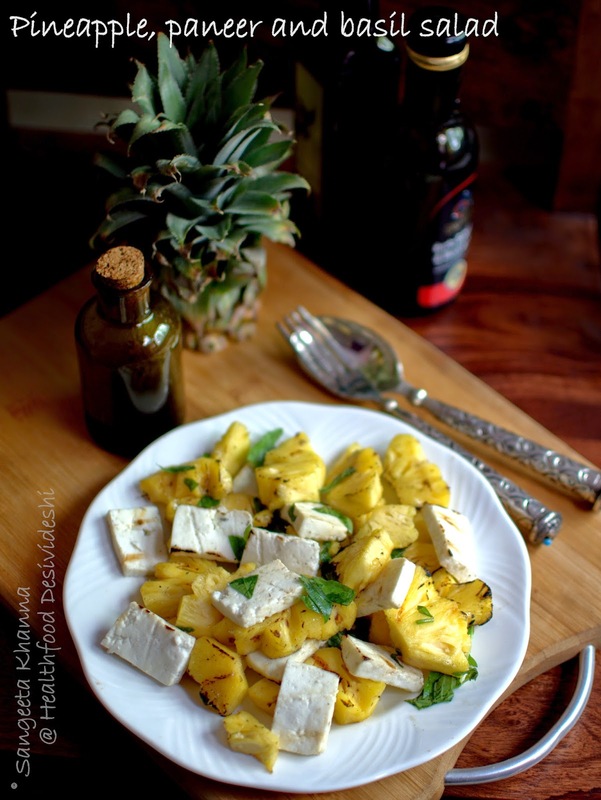 Actually I keep looking for fully ripe pineapples just for this salad. 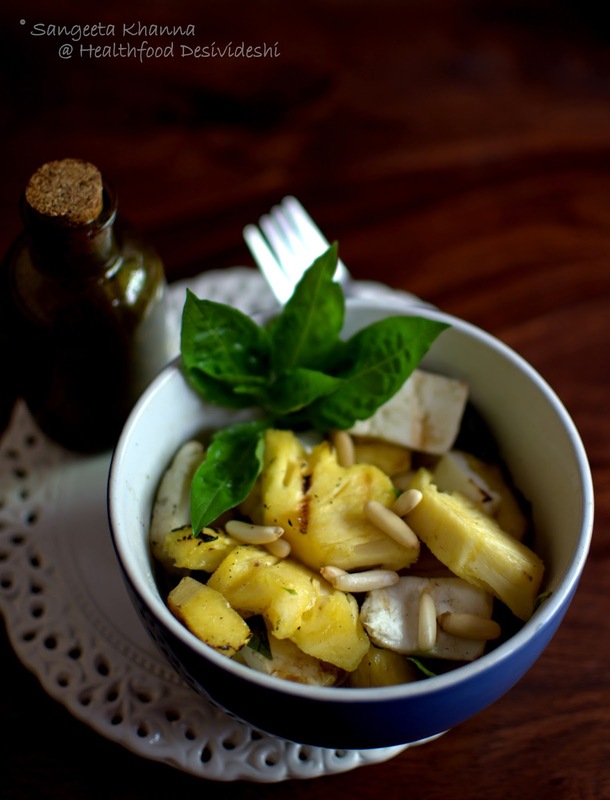 The deep yellow, slightly soft and sweet pineapple slices make this salad something else. Grilling does some magic to the sweet supple pineapples slices. And yes, to the paneer cubes as well. The salad is not much of a recipe in fact. 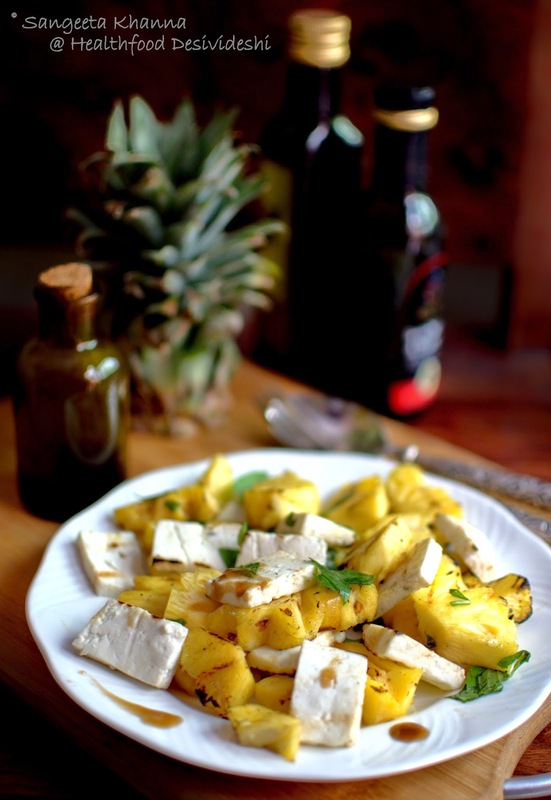 You just have to grill the pineapple slices and paneer cubes over gas flame or barbecue grill if you have set that up (I cannot think of a barbecue in this Indian summer), and toss them up with a mix of balsamic vinegar and extra virgin olive oil. Or just use any dressing you like. I often do it with chaat masala or just salt n pepper. Adding herbs of choice and a few nuts at times is what I do. I have loved fresh rosemary in this salad too and finely chopped coriander greens as well. Mint goes with all fruits if you ask me. So go by what you have around, just the pineapple should be really ripe and the paneer should be fresh, preferably home made paneer. You just have to place a grid or whatever contraption you use for grilling over gas flame and arrange the pineapple slices over it. Turn them when lightly charred and then do the same with paneer slices or cubes. Take care to place the hot grilled paneer cubes into a bowl that contains a tsp of EVOO and toss it immediately, otherwise they stick together. The milk proteins in paneer have a tendency to stick when hot. When you are done with grilling, just toss everything together with your choice of dressing/seasoning, herbs and nuts. I used fresh Thai basil here and a mix of EVOO and balsamic vinegar. Salt should be minimal in my opinion, but adjust seasoning after mixing well. Pine nuts and chopped almonds is my preferred choice for this salad, but I do add roasted peanuts when I season it with chaat masala. The last week I enjoyed this salad with only this EVOO and balsamic dressing. I had mixed the dressing in a small bottle and kept on the table ready for the week. This is addictive stuff let me tell you. Use fresh mozzarella if you can get. I add specks of feta cheese when I want to add a little saltiness without the addition of salt in this salad. FYI, your salad ideas have inspired some salad ideas in me too..will be coming up on the (food) blog soon!! Lovely and colorful salad.. looks great!! 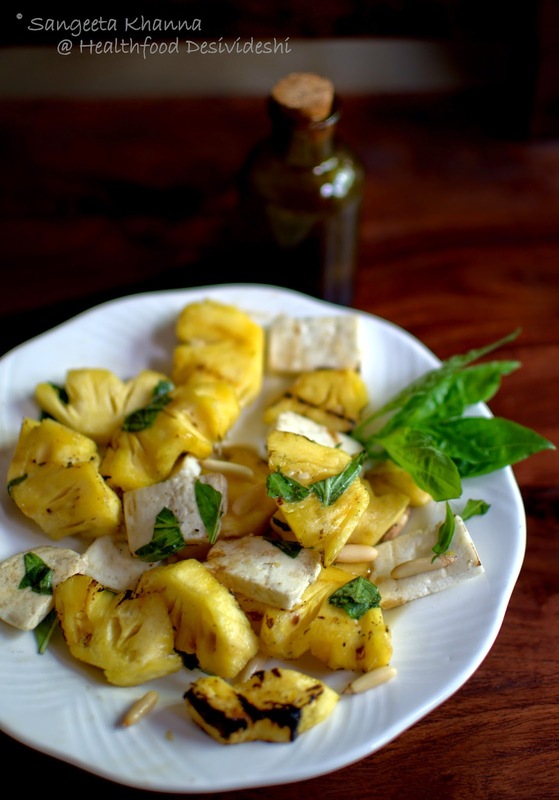 grilled pineapple just tastes fab on its own and with grilled paneer its a superb combination. I ve always loved your recipes but I must say now Your photography makes it so appealing that I want to try it this afternoon itself . Healthy recipe thanx for sharing . I know where you are coming from..mmmm! You've got me hooked onto pineapple too. I love both pineapple and paneer. Must try this asap!